TWO PEOPLE when rescued when their boat capsized in the ocean waters off Huntington Beach on Thursday morning (Orange County Sheriff’s Department photo). 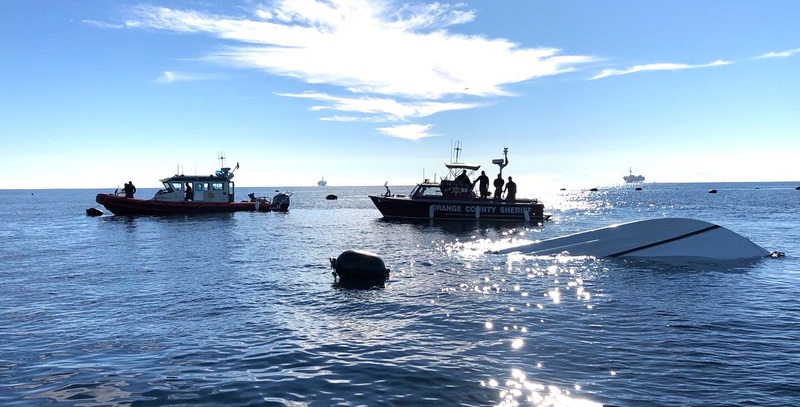 Two people were rescued from the water near their capsized boat in the waters off Huntington Beach on Thursday morning. The rescue began when Huntington Beach Police Department helicopter HB 1 spotted an overturned vessel and requested by radio a marine safety officer to help in pulling the two to safety. The helicopter flew to a landing zone on the ocean side of the lifeguard headquarters at the city pier and picked up MSO Doug Leach. When the chopper arrived at the scene, a U.S. Coast Guard ship and one from the Orange County Sherriff’s Harbor Patrol were there with two victims in the water, one conscious and one unconscious. Leach jumped into the water and took the two victims to safety. They were taken to the Simple Green dock in Huntington Harbour where they were treated by Huntington Beach Fire Department paramedics. One victim was taken to Hoag Hospital in Newport Beach and one to Los Alamitos Medical Center.